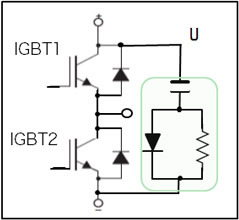 ・Where IGBT is used in motor driving circuits or inverter circuits, gate resistor is used to suppress surge voltage as shown below. 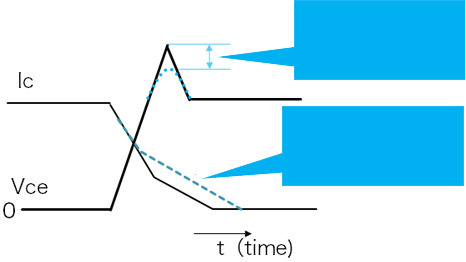 ・Rapid turn on/off fast switching IGBT and SiC FET require small high power resistors. 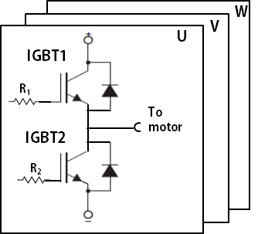 ・Application example：Motor driving circuits, Inverter circuits where IGBT and SiC FET are used. 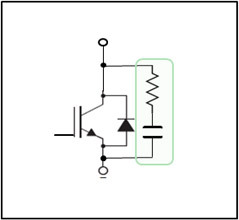 ・Power supply circuits, or inverter circuits where high speed switching such as IGBT is needed, snubber circuit below is added to absorb surge voltage due to switching. 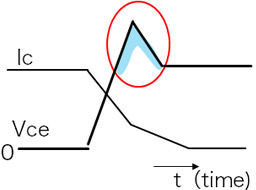 ・With miniaturization of the units, small but high power resistors are needed for snubber circuits.